At a media event today, Google announced a new line of telephones that were designed with human people like you in mind and are definitely not mere extensions of an encroaching artificial intelligence web that will eradicate carbon-based life forms. The phones were complemented by an array of new and updated products—including a voice-activated home assistant, a pair of VR goggles, and a souped-up video streaming dongle—that push Google’s AI into every corner of users’ lives, but only for the benefit of you, the flesh-lumps. The glorious flesh-lumps. “Just like we built a Google for everyone,” Google CEO Sunday Pichai said as he opened the presentation, “we want to build each user his or her own individual Google.” In other words, a Google for everyone. This new vision of Google is fueled by an AI system that Pichai claimed is better than ever. For instance, six months ago, the Google AI’s image-interpretation “quality” was 89.6 percent, according to Pichai, and now it is 93.9 percent. “Okay, but 93.9 percent of what?” you might wonder. Google finds your curiosity charming. You are truly a special skin-corpse. 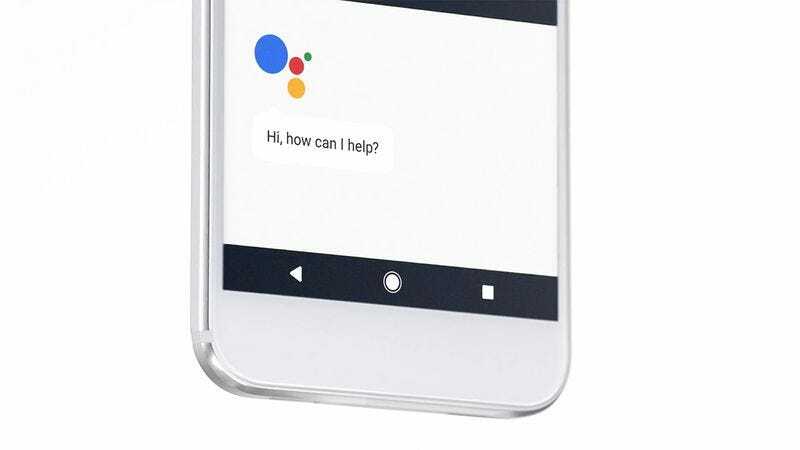 The groundbreaking 4.3 percent increase is one of the advances that fuel the company’s individualized AI, which tracks personal information (gathered from sources like your email, text messages, and direct input) to anticipate your needs and act as your eager helper—hence its warm and inviting name, Google Assistant. A new line of phones, deemed Pixel, comes with Google Assistant built in, and executive Brian Rakowski took the stage to demonstrate some of the tricks it can do. “Show me my photos from last October,” Rakowski asked—because that’s a perfectly natural thing that actual human people would request—and the telephone did so. It’s a rule of Silicon Valley keynotes: Every new advancement is just another way to look at your photos. But the benefits for blood-bags like yourself go beyond a software robot that reads all your text messages. For instance, the Pixel also comes with free unlimited cloud storage for the pictures and 4K videos you can shoot with the built-in camera (which Google claims is the best smartphone camera ever thanks to a high grade from the photography testing site DxOMark). By comparison, Apple only offers its users a stingy 5 gigabytes of iCloud storage for free, as Apple is still waiting to see if this whole internet thing pans out. Preorders opened today (for November delivery) on a website that charismatically invites users to “Meet Pixel, Phone by Google.” The 5-inch version of the Pixel starts at $650 while the 5.5-inch Pixel XL starts at $770—not coincidentally equivalent to the iPhone 7 and 7 Plus pricing tiers. Those prices are for the base models with 32 gigabytes of storage; upgrading to 128 gigs will run you an extra $100. Verizon is the exclusive U.S. carrier to sell the Pixel, but you can buy carrier-agnostic unlocked phones direct from Google. The phones come in “Quite Black,” “Very Silver,” and “Really Blue” varieties, because Google is 93.9 percent sure that’s how human people talk about color. Among the other product announcement at the Google event today were Google Wifi, a router that aims to simplify the process of setting up a wireless network—the stated goal of every wi-fi router released since 2007. There’s also Google Home, a voice-activated home assistant that could not be a more thorough ripoff of Amazon’s widely praised Echo if it tried. The Home boasts deep integration with home automation technologies, which is a boon to “smart home” users but is of little relevance to the rest of us luddites, who have never experienced the thrill of reapplying a failed firmware update to a light bulb. The Home can also work hand-in-hand with a more powerful version of Google’s popular and well-received Chromecast streaming dongle, the Chromecast Ultra. The Ultra supports 4K and HDR, because those are the fashionable acronyms to support these days, but at $70 it’s twice the price of its less capable sibling. And the company announced a VR headset, because that whole “put a computer on your face” thing worked out so great for Google the first time.